The season’s barely started, yet by last count we’ve had seven teams make a switch from their projected closer. Some are injury related, and some are simple managerial decisions. The decision by the Toronto Blue Jays to remove Jason Frasor from the closer’s role in favor of Kevin Gregg falls under the latter. Normally, making a switch this early would scream knee-jerk reaction. On the other hand, Gregg and Frasor were locked in a tight battle this spring, and the Jays didn’t give Gregg nearly $3 million this winter without considering the possibility that he might close some games. Frasor has struggled in his five games so far. Meanwhile, there is concern about his velocity, which is down more than two miles per hour from 2009. That could just be a product of building up arm strength early in the year, but also good reason to lower his usage in high-leverage situations for now. Gregg came to Toronto after one disappointing season with the Chicago Cubs. Despite the ugly 4.72 ERA in Chicago, his peripheral stats were pretty good. His 9.31 strikeouts per nine innings (K/9) were just off his career best and among the highest such rates in the game. His walk per nine innings (BB/9) of 3.92 was his lowest total since 2006. Gregg struggled with the long ball while in Chicago. After allowing 10 home runs in two seasons with the Marlins, he yielded 13 homers in 2009 with the Cubs. Some of that was bad luck, though: Gregg posted an aberrant 15.3% home run-to-fly ball rate (HR/FB), much higher than his career rate of 8.5%. He is likely due for some regression. If we normalize his HR/FB from 2009 using expected fielding independent pitching (xFIP), a metric that looks at things pitchers can control like strikeouts and walks with a normalized home run rate, we see Gregg’s xFIP of 4.18 last year was a lot better than the near 5.00 ERA. In addition to regression, Gregg has made some changes in pitch selection that could go a long way in lowering his home runs allowed. 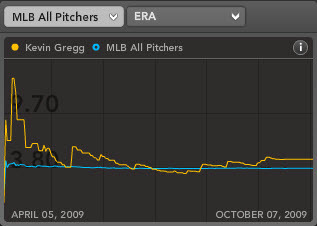 Since 2003, nearly 85% of Gregg’s pitches have been a fastball (65%) or slider (18%). But in early 2010, he’s thrown the pair of pitches less than 60% of the time. In their place, he’s throwing more split-fingered fastballs (8.4% career, 23.1% in 2010), and has reintroduced a cutter to his arsenal. Gregg has dabbled with a cutter before – throwing it 2% of the time in his career – but is throwing the pitch nearly 20% of the time so far this season. Please note that all these percentages are extremely small sample sizes, but don’t ignore the fact that Gregg has made some adjustments. It also seems the pitch selection changes have changed the type of pitcher Gregg is. He’s getting nearly 70% groundballs this year after getting less than 40% for his career. Of course a 70% groundball rate is unlikely over the course of a full season (unless you’re Chad Bradford). Nonetheless, if Gregg and his newfound weapons can keep that ground ball rate above 45% (or even better, 50%), that would be a nifty shift for the 31-year-old. If he’s available in your league, immediately grab Gregg regardless of size and format. Frasor and Scott Downs are still in the mix, but all things considered, Gregg is looking like a strong play, especially in a season that has seen a 23% turnover rate at the closer position in just 10 days. Also remember that Toronto has seen a different saves leader in each of the last five seasons including Frasor in 2009. This trend looks likely to continue in 2010. For more on Kevin Gregg and the Toronto Blue Jays check out Bloomberg Sports’ fantasy kits. The Jays are staging a three-man competition for closer this spring, meaning there’s a good chance we will see another new face atop that list. The three men involved in this competition are Toronto stalwarts Jason Frasor and Scott Downs, along with the newly acquired Kevin Gregg. Let’s focus on Frasor and Downs first. The Blue Jays turned to Frasor for their closing duties last season after releasing the oft-injured B.J. Ryan in early July. Frasor, who had closing experience from his 2004 rookie campaign, responded well to the promotion, putting up a 2.50 ERA, striking out 56 batters and walking just 16 in saving 11 games for a bad Blue Jays team. The 2.50 ERA is nearly two full runs lower than it had been over his three previous seasons, so some regression might be in order – despite some encouraging progress in his walk rate, which was by far the best of his career. 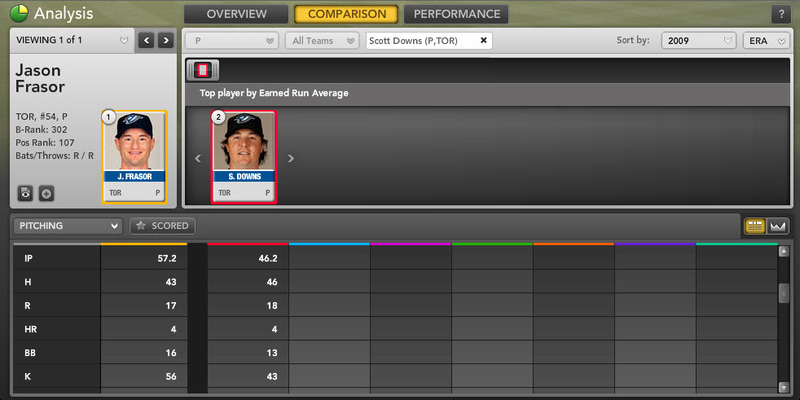 Since converting into a full-time reliever in the 2007 season, Downs has been one of the best set-up men in baseball. His ERA hasn’t finished above 3.09 and his Ground Ball Percentage (GB%) has never fallen below 55.7% in that time frame. That last part is important since keeping balls on the ground, and by extension in the yard, is an important part of a closer’s duties. Downs did save nine games a season ago, but Blue Jays Manager Cito Gaston seems like he’d rather Downs fill the type of roving reliever role that J.P. Howell has with the Rays, saying: “I’ve got a feeling that Scott, he’ll pitch anywhere you want him to pitch. He’s not going to be upset if he’s closing or not closing.” Not a good sign for the Scott Downs For Closer supporters out there. The Blue Jays signed Gregg to a one year, $2.75 million dollar contract this winter. Gregg is an experienced closer with 85 career saves under his belt. He had a rocky 2009 season with the Cubs – his ERA was over 5.00 in early June and ended at 4.72 – losing his closing to Carlos Marmol. That’s even though Gregg posted a 9.31 K/9 and his lowest walk rate since 2006, numbers which suggested some back luck on the ERA front. Home runs were his bugaboo, allowing 13 in only 68.2 IP after yielding just 10 in the previous two seasons combined. The 13 home runs are an outlier, likely to make their way back down this season, which would in turn make Gregg’s other numbers look respectable once again. If the Jays wanted to make a decision based solely on spring stats (a policy we would not advise given the issues of small sample size and uneven competition), Downs and his 0.00 ERA and 5 Ks would be the runaway winner to this point, with Gregg (5.40 ERA) second and Frasor (8.31) a distant third. 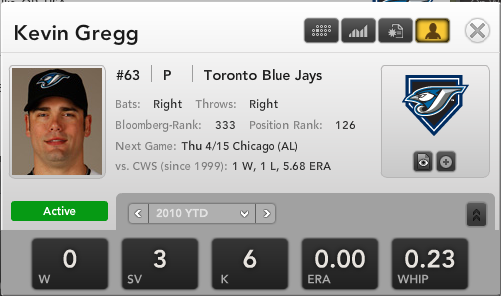 Taking everything into consideration, Gregg looks like the Jays’ most likely pick. Losing teams rarely spend nearly three million dollars on a reliever that’s not finishing games for them, and 20-plus saves for Gregg at the trade deadline could make him more attractive to a contender, potentially enabling the Jays to add prospects to their farm system. Gregg’s Average Draft Position is 329th, making him a cheap late-round pickup that could end up paying dividends – even if only for a few months. For more information and tools on evaluating the closer position in your draft, check out Bloomberg Sports’ fantasy kit.